This past Saturday, November 12th, marked the 7year anniversary of losing my sweet daughter Katie. Not sure what happened to the last 7 years, but they’ve managed to slip away. I know many of you that follow this blog are newly bereaved and probably think “7 years? I am not sure if I can make 1 year or 2 years. How will I ever be able to make it 7 years?”. Those are excellent questions, questions I also asked myself at the beginning of this hell. I know the feeling of surviving second by second and then moving to minute by minute, hour by hour, day by day, etc. The thought of surviving a year early on seemed doubtful, but here I am, 7 years later writing a blog posting about the horrific experience of losing a child. Obviously it is still with me after 7 years, but the pain of the anniversary days have faded. I made a conscience decision at some point along the way that I was not going to run and hide from this day, because that’s not possible. I knew I was going to find a way to celebrate Katie’s life the best way I could. So the first year anniversary my wife and I took the day off of work and spent the time reflecting on her life and what our life has become and where we want our life to go as a way to honor her. Looking back over the last 7 years I have witnessed the transition from the person I use to be to the person I am today. I use to be pretty self serving and non-tolerant of others, but have now found a way to become a person that tries to serve others by helping them the best way I can. Do I fail at this from time to time? Absolutely, I would be lying if I said no, but I would say this new direction in my life is one positive thing that has happened to me. Would I change it all to have her back, no doubt, but that’s not an option so I know I have to proceed with what I have control over and that’s how I want to be known as a person. The positive changes I made in my life are a direct result of losing my sweet Katie. It is the gift of love, compassion and understanding that Katie so graciously gave me. I know there is a list of hundreds of negative things that have happened to us after the death of our children, trust me, I have plenty, but what things have changed in your life that you would consider positive? If you can’t think of anything positive that has happened in your life since the death of your child, what positives would you like to see happen in your life? This doesn’t necessarily relate to anniversaries, but in a way it does. Thank you for your post on this. My 20 yr. old son Daniel died Nov. 3, 2009 so it’s just been over 2 years. We had a supper with all his friends & family reminiscing about some of the funny things he used to say and do on this past anniversary. On his birthday of June 30, the 1st year after his death, we all signed a card & attached it to helium balloons & let it go to the sky. It certainly has changed me as I can never be the person I once was. I certainly have a lot more empathy for others who have lost a family member of any degree even though many people who have lost a sibling or spouse say that they can’t imagine my grief at losing my son. I believe now that grief affects us all but that we express it differently. I am no longer ashamed or afraid to cry in public although I no longer do as much of it as I did the first year. Every now & then a wave of sadness engulfs me but now I know it will pass and it no longer has the same intensity as the 1st year. Again, thank you for your work on this and encouraging dads to do their grieving in whatever way works for them. I too thought there was no reason to go on living at first and even wanted to dive into the hole as his coffin was being lowered & get buried with him but now can enjoy my memories and share them with my loved ones who are left here with me. I believe I am a better man now than I was before this but I sure wouldn’t want anyone else to go through it. However as someone else posted-I now try to accept the things I can’t change like his death & change the things I can like my response & reactions to his death. Your feelings of wanted to “dive into the hole as his coffin was being lowered” is pretty common. I hear from a lot of dads (and moms) that do not want to continue living. The worst part is getting through the days you see no hope. Once you feel or see a glimmer of hope for the first time after being in the depths for so long, it changes everything, you started to realize there is hope coming, it just takes time. Everyone’s time is different. No one can (or should) say grief takes a year or whatever, because it gave me false hope. I wasn’t done at 1 year and it scared me to think I would be that way forever. Thanks for you comments Dan. I am a grieving mom, but I hope it’s okay that I comment on your post. When we lost our teenage son Ricky in a car-wreck New Year’s Eve 2010, I tried instinctively to focus on the positives rather than the negatives. While this is harder than anything else I’ve ever done, it has helped us deal with our grief. We started a foundation, the Ricky McAllaster Foundation, to promote teen driving safety as well as youth lacrosse (his favorite sport). We have created keychains for all the students at his highschool so that they remember when they turn the keys in the car that calling for a ride and getting in trouble for drinking beats being killed in an accident every time. I’ve also written about the signs Ricky has shown us since his death to show us that he is okay. I hope others will read it and understand that their sons and daughters, parents and grandparents are okay when they are gone as well. You are welcome to post here anytime you would like. I am glad you are here. I applaud you for the work you are doing to honor Ricky. It sounds like you are making a difference in a lot of peoples lives. Feel free to send me a link to the foundation and I’ll add it to the support page. I would consider the main positive thing to come out of Colin’s death is that I learned to not waste energy on, for, or with anything or anyone not worth that energy. It has simplified my life and has made me a better overall person. Given that Colin was two months old when he died, he really could not give gifts while alive but he has given me a gift that (while not the way I wanted to get it) is the best gift I have ever received. Simplified my life. Excellent statement. All trhe “stuff” we use to think was important is no longer. Living a minimalistic life removes a lot of stress taht quite franky our nervouse systems can no longer handle. Going back to the “old way of living” is not an option. Not wasting that energy is a form of self protection. We learn what our new thersholds are try to recreate a life that can fit within it. I could easily disappear into a simplified life. I already have on many levels, but I know I could do more. Kelly- The “angel days” are the worst days of every parent who’s lost a child. Your post brings me back to a blog post my wife wrote last year. I think her words are very relevant to your post on anniversary days..
…it really brings Scott and I back to those first few days, weeks and months after Quinn died, and it makes us realize how far we have come. I don’t know if you ever “heal” from something like a loss of a child, because to me healing means fixing and you can’t fix a loss of a child. What we can do is learn to live the life we have been given, and realize to move forward, we need to accept that we cannot change the past, we can only control our future. You need to let go of finding someone to blame, you need to let go of wishing things were different, you need to forgive yourself for not being able to change what happened… and you need to realize there is a lot of life to live with those who are here and those that love you. If you stop living, you have lost. You cannot move forward while living with regret. It doesn’t mean you won’t think these thoughts, but you will know how to move past them when they creep in. Although I would give everything I have to have Quinn back, that’s not a choice/option I’m given. But I will live every day grateful for the son I had, and all the wonderful memories of the time I had with him. Quinn may not be here in body, but he will always be here in spirit. We talk of him often, and allow him to be in our present life, and that helps us feel connected. Moving forward for us has been finding a mission to do something positive from something so tragic. Quinn wasn’t given the opportunity to have his own future, but in his memory and using his story, the impact he will have on others will be invaluable and others will be saved because of what happened to him and our family. I think healing is a mindset of coming to the realization that we cannot change the past, but we can decide what to do with our future. We chose to continue to live, and to make a difference. We know that choice is what Quinn would have wanted. He cared too much about others for us to stop caring! Lots of excellent points in your posting. “healing is a mindset that we cannot change the past, but we can decide what to do with our future” so true. Not to say you wont have set backs from time to time, but you can’t undo what has happened. Its takes a lot of time and pain to get to thie frams of mind, but there is a since of hope that comes with gettign there. Keep up the great work Scott!!! And I guess that’s the hardest part to accept: the finality of it all. But, like you said, we can live on and keep the memories of our children alive in our hearts and minds and in our deeds. Thanks for the kind and insightful words. I copied them and printed them out and put them in my daily notebook. Man, 7 years! I just passed the 4 months mark for my daughter Leslie, and while I know I’m in and will be in for a long time, Hell, the biggest thing is even caring a fig for anything that goes on; even the good things. Most of the time, it doesn’t really matter any more. I know that in the future to honor Leslie I will have to do something — create a memorial, start a foundation, anything. But right now, I try to only cry when I’m in my car or alone in the house. 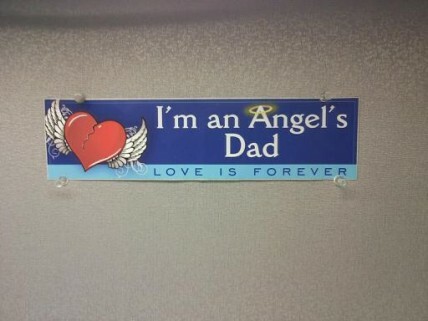 I love the little “I’m an Angel’s Dad” banner. Where can I get one? Are those decals? Thanks. As this progresses, things to honor Leslie will start to reveal themselves. Go with them. They may change overtime, but there is healing in honoring our children. As far as only trying to cry in your car, cry anywhere you want and when ever you want. If people don’t like it or they feel uncomfortable with it, that their problem. Do what you need to do for you. I had a good friend tell me when i was in my depths that I shouldn’t try to fight the emotions when they come, embrace them and let them be what they are at the moment. Soem fo the best advice I ever received. Do the best YOU can. As far as the banner, I ahd another grieving dad give me a copy of one. I was thinking about ordering a bunch of them and give them out to grieivng dads. Their only like a buck a piece and i think they are pretty cool. They are ment to be a bumper sticker but i was going to see if I can get them as a magnet or clear window decals. I have searched in vain for that bumper sticker and one like it with “mom” for my wife. If you have a source, please share it. Sorry, my e-mail was wrong in the last message. Fixed this time. I am sorry about the loss of your daughter. 7 years is a long time. Any anniversary is very difficult. For us, Audrey died August of 2010. We had her for 11 days. I remember thinking as the one year anniversary approached; “It will get better”. I even told my wife, “This will be the last day of the worst year of our lives”. It has to get better. I thought I could put a deadline or goal post on grief. How wrong I was. I am glad that you have been able to do so much for others while coping yourself with tremendous loss. I find it inspiring and encouraging. As for positive things, I would like to be able to seperate the positive aspects of my daughter from the negative circumstances of her death. To rememeber her without her life being defined by the negative things that happened to her and contributed to her death. How has this been for you? It’s easy for us to put a time frame on our grief. It stems from wanting the pain to stop so we cling to the “grief takes about a year” comment that you read by all of the professionals. Maybe for other types of grief I can buy that, but the loss of a child is different. 1 year is just the start of this difficult journey. I remember sitting in front of a counselor asking why I wasn’t feeling better, it’s been a year. I wish I could tell you when it will start to let up, but I can’t. All i can say is don’t give and keep talking about the pain, Audrey and your experiences. There is healing in allowing yourself to be vulnerable. As far as seperating the negative images vs. the positive thoughts takes time. Your brain has to “go to the pain” for a while to process it. As difficult as it is, allow your thoughts to go there and work through them. My wife and I lead a grief support group. We NEVER would have if we had not experienced deep grief over the death of our daughter Rachel. I hear you, the old me wouldn’t ahve been doing the grieving dads project. I was to “busy” with my own life I never thought I had time to help others. I always thought someday I am going to help others, but that someday would still not be here if it wasn’t for my own experiences. Thank you for sharing Steve.